TOMS shoes have taken the wedding footwear scene by storm and I'm happy to report that these ultra comfy flats can be even more tailored to your liking. 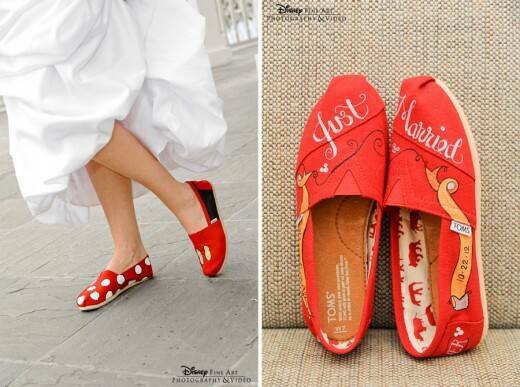 Our friends over at Curl by Sammy Duvall in Downtown Disney allow brides to add personal and unique touches to their very own pair of hand painted TOMS. What better way to include all the fabulous details of your big day than on a pair of TOMS that are as unique as you - a perfect keepsake to cherish after you say "I do". Whether it's inspiration from Mickey and Minnie or completely custom soles, no two pair will ever be the same.